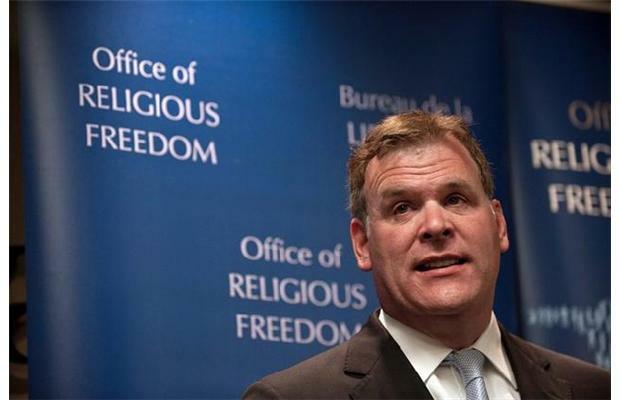 Foreign Affairs Minister John Baird and Andrew Bennett, Canada’s ambassador for religious freedom, are announcing $1.2 million for projects to promote tolerance for religions around the world. Bennett was appointed as religious freedom ambassador earlier this year. Andrew Bennett, Canada’s ambassador for religious freedom, right, and Foreign Affairs Minister John Baird, second from right, met with Nigerian community leaders in Toronto on Monday. The office, which is modelled on a similar department in the U.S., aims to protect and advocate on behalf of religious minorities under threat, and oppose hatred and intolerance for religion, according to the website of the Department of Foreign Affairs. $553,643 over two years for the promotion of “intercommunity dialogue and conflict mediation” in Jos, Nigeria, and other parts of Nigeria’s Plateau State to develop local mediation capacity and bring together community and religious leaders to talk, and will train 10 senior government officials and key persons from institutions dealing with peacemaking to strengthen the federal government’s capacity to support conflict management and resolution. The project funding is going to the Centre for Humanitarian Dialogue. $672,000 over three years for national training events for government officials and civil society actors in Eastern Europe, Central Asia and South Caucasus, funding for up to 10 small-scale projects seeking ways to address violations of freedom of religion or belief at the national level, and the launch of guidelines on the recognition of belief communities. The funding is going to the Organization for Security and Co-operation in Europe (OSCE) and the Office of Democratic Institutions and Human Rights (ODIHR). Baird says the goal is to establish a roadmap to strengthen the countries’ capacity to encourage conflict management.